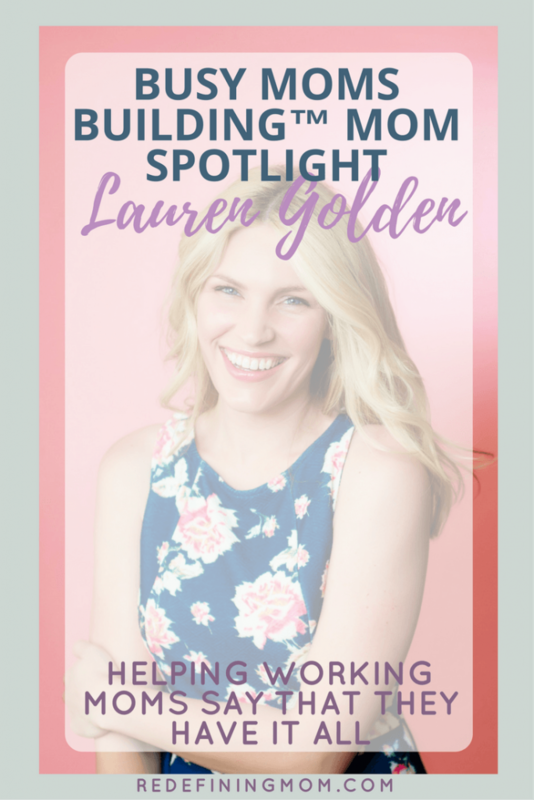 Lauren Golden is a wife, mom, blogger, and iced coffee enthusiast. 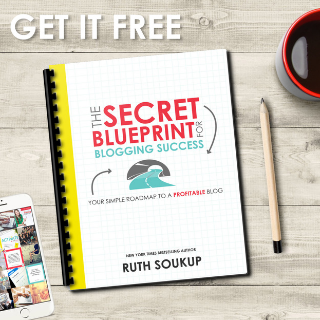 As a perpetual pursuer of a healthy work/family balance, she traded in her 9-5 and launched her own digital marketing company from home in 2015. She lives for family meals and impromptu dance parties with her husband and 3 young kiddos—Daphne, Henry and Audrey. 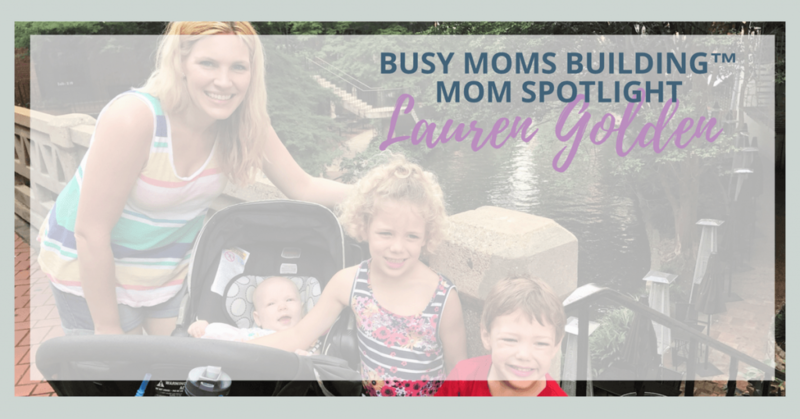 Lauren is passionate about working moms and hopes to boost a community in which all women can say they have it all. My name is Lauren Golden and I live in Katy, Texas with my husband, Justin, and our three kiddos. Daphne is 5 and off to Kindergarten in the fall, Henry is 3 and finally starting to poop in the toilet, and Audrey is 5 months and the serious one (so far). 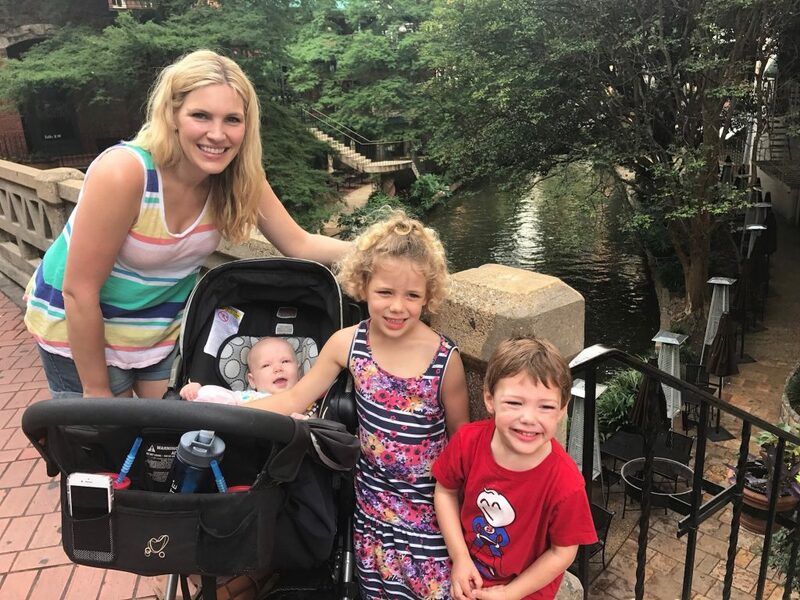 We moved here from Kansas City exactly a year ago for my husband’s job when my digital marketing business was just 6 months old and I was 12 weeks pregnant. That’s right, I moved cross country with two toddlers, morning sickness and a brand new business. In spite of all of the changes brought about last year, I was able to replace my full time income in one year working just half of the hours from home. I always knew I wanted to be a mom, but I never really thought about what that would look like. After I had my daughter, it wasn’t a financial possibility for me to stay home and so I returned to the workforce. It turns out I was thrilled to be able to continue to grow professionally while learning the ropes as a new parent. 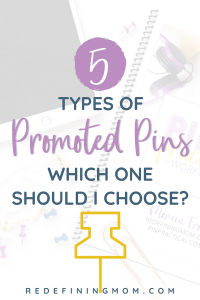 But after we welcomed baby number two, I began to resent working for someone else who told me where to be and at what time and what my goals should be. Each day I felt more and more guilty about being a grumpy parent by the time I got home from work. And my husband felt nearly invisible as he slipped to the bottom of my priorities list. I knew I couldn’t give up my ambitions, but I was tired of feeling like my family came second to my employer. It came down to deciding that if I wanted to live a certain lifestyle, I was going to have to create it. I decided that if I wanted to live a certain lifestyle, I was going to have to create it. So I launched The Free Mama, LLC (which is the name of my blog for working moms who believe that it’s possible to have it all) and TFM Media, a boutique digital marketing and business strategy firm dedicated to helping female business owners grow their companies online. 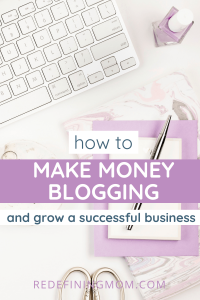 Are You Looking to Start a Blog and Grow a Profitable Online Business? 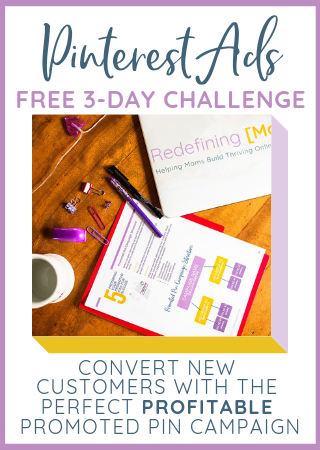 Here are some free resources from Redefining Mom to help you get started with your online business journey! Now that it’s summertime, I’m a bit off of my “typical” schedule. During the school year, I drop my oldest two off at preschool from 8 am to 2 pm. These are my set work hours and, while I will respond to urgent requests outside of those times, I make sure my clients understand my “office hours”. Boundaries! After I pick them up from school, it’s family time. We head to the park or play at home, make dinner together and read or watch a movie before bedtime. I check back in on my computer most evenings after the kids go down, as well. This summer we decided to take my kids out of childcare for the first time in their lives. I have a nanny at our house a few hours each day so that I can get my work done, but it’s been a pretty loose timeline. 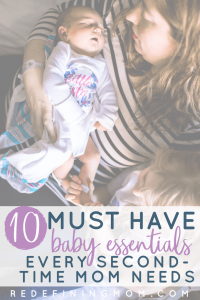 I’m still learning to juggle it all with a baby at home and inconsistent nap schedules. Grace is important for not losing my mind! I will also say, flexibility and a supportive partner have been key for keeping my business going during this ever-evolving time in our family’s lives. The biggest challenge for me is also exactly what I wanted when I left my traditional job: managing my ambition with my family life. I have a lot of business aspirations for myself. I can really beat myself up when it seems like others are achieving more than I am. Sometimes the end of the kids’ school day seems to come way too soon. There was one more project I wanted to work on or one more sales call I wanted to make. I have to actively remind myself that I left my 9-5 to spend more time with my family. The work will always be there tomorrow, but my kids won’t always be around as much. It’s a nice reality check that sets my priorities straight, keeps me from comparing myself to others, and reminds me that I’m exactly where I’m meant to be. Good question. I believe women, especially moms, don’t toot their own horns enough. We are amazing! Think about everything we accomplish each and every day! I believe women, especially moms, don’t toot their own horns enough. I am incredibly efficient and great with prioritizing, but my superpower is definitely breastfeeding. Seriously, I never get tired of it and I can nurse a baby good and fat! I use time blocking to schedule my day. If you’re unfamiliar with the concept, whip out your planner or calendar. Then write down the top priorities you have for the day, just the absolute must-dos. Then, actually schedule them into your day with a start and end time for working on them. Ideally, you’d set this up the day before so that you don’t work precious time at the start of your day. If you want to time block like a pro, tune out distractions (email, FB, etc.) during a scheduled time. Don’t over block or you’ll be a mess if something takes longer than expected or something urgent comes up. I start everyday with theSkimm newsletter. It gives me a daily dose of the day’s news headlines so that I’m not tempted to scroll endlessly through social media to see what’s going on in the world. When it’s time for work, it’s time for work. I have a limited number of hours each day dedicated to my business. It’s important to me not to waste them. For professional development, I am currently obsessed with Marketing Secrets podcast, as well as the Wire Talk Mom’s Ministry Podcast. As far as networking, I am a member of FemCity, an international community for women in business. I also participate actively in several industry specific and working moms Facebook Groups. It can get lonely working from home! Awesome! I’m not current accepting any additional clients for digital marketing. But if you’re a working mom who believes we can have it all, I invite you to follow along at The Free Mama. 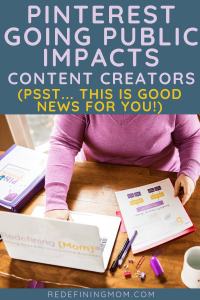 I’ve got some exciting stuff happening to support moms looking to decrease guilt and increase profits through entrepreneurship! Very inspiring. Right now, I’m just overwhelmed with the limitless work from home info online. Connecting with moms that work from home is the most helpful for me. I am right there with you! 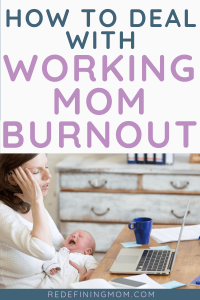 If I could only find a job from home that offered me the flexibility and pay needed to pay the bills as a mom and working professional it’s hard to balance it all. I’m just getting started on here so unsure what to expect. I am exhausted and have held off trying for a second child with the fear of a daunting lifestyle having two kids in daycare and working with a long commute. I need a change!